Oh well, how things change. 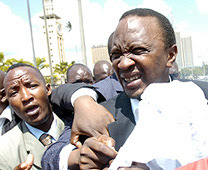 I sat and watched as Uhuru Kenyatta, Kalonzo Musyoka and William Ruto, were enveloped with tear-gas fumes. In their hey days in Kanu they would mock us as rioters and had no mercy on those fighting for freedom of assembly. I believe that had they done their bit to change the relevant laws we would not have witnessed that drama. Those in government should learn a lesson...the police hardly change but can be tamed with good laws. Cry Uhuru, cry Freedom. sorry, I don't mean to spam, but there is no email address to contact you. Please drop me a line at webmaster@kenyaimagine.com , I have a proposal for you. Who cares about thugs being honored. We should honor true hearoes like Oginga Odinga, Tom Mboya and Robert Ouko NOT law breking Mungiki like this thug.